Posh centre back Ryan Tafazolli shoots at the Southend goal. Photo: David Lowndes. Peterborough United manager Grant McCann has ordered his players to ‘stand up together like men’ after another demoralising League One home defeat tonight (February 21). 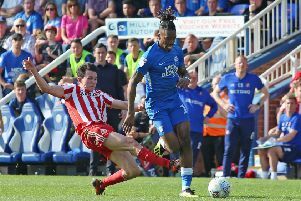 Patched up Posh - three key midfielders missed the game - were hammered 4-1 by play-off rivals Southend United at the ABAX Stadium. Posh remain in ninth place, but they are five points off the play-off places after conceding four goals at home for the second time in four outings. Posh forward Marcus Maddison shoots during the 4-1 home defeat by Southend. Photo: Joe Dent/theposh.com. It was a performance and result which makes a top six finish look most unlikely, but McCann is not yet ready to throw the towel in. “After a defeat, and after a home thrashing like this, it’s important to stand up like men and stick together,” McCann stated. “Obviously we have to improve quickly before another important game on Saturday, but we will only manage that if we work hard as a group. “We’re at the business end of the season now and five points is not a massive gap with 13 games to play, but we need to get our form and confidence back quickly. Posh skipper Jack Baldwin is down in the dumps after the 4-1 defeat by Southend. Photo: David Lowndes. “Some might be giving up, but me and the players won’t until it’s mathematically impossible. If you stop believing you certainly won’t get anywhere. “We will get back to work on the training ground and get ready for a tough run of fixtures. “We were in this game right up until we conceded the first goal on the stroke of half-time. I tried to pick the players up, but their confidence was knocked and it never came back. “Southend then scored twice in quick succession in the second half because of our own basic errors. We did rally and start to threaten. We scored and we hit the woodwork, but there’s no point in starting to play when you’re 3-0 down. “We did okay in the first-half, but we weren’t on the front foot quickly enough. I want to see us have decent efforts on the opposition goal, but we lack a killer instinct whenever we get near the penalty area. McCann was forced into three changes to his starting line-up with midfielders Chris Forrester (suspended), Anthony Grant (suspended) and Gwion Edwards (injured) all absent. Edwards is likely to miss the rest of the season after sustaining knee ligament damage at Walsall on Saturday. Central defender Jack Baldwin was recalled in place of Dominic Ball and made captain for the night despite not having played since November 22. Michael Bostwick played in midfield despite breaking his jaw just 24 days ago. McCann also left striker Lee Angol on the substitutes’ bench for the whole game despite the desperate need for goals. McCann added: “Dominic Ball is a good player, but we showed our best form before Christmas with Ryan Tafazolli and Baldwin at the back and Bostwick in front of them which is why I went with them in this game. “I could have brought Lee Angol on, but we were in the ascendancy in the last quarter of the game so I stuck with what I had on the field. Tom Nichols had scored, Craig Mackail-Smith was doing well, while Marcus Maddison and Paul Taylor were causing them problems. Posh host Rochdale, the team a point and a place above them in the League One table, on Saturday (February 25). Then it’s two daunting away games at Millwall and Bradford City.